Are you worried about your child's mental health? Do you think that studying for exams is damaging their mental health? But first, I'm going to share some of my own experience of succeeding in exams and the ups and downs of my own mental health along the way. I hope that sharing this experience will give you examples of what does and doesn't work so that you can implement elements that will work for your child in your family life. I've always thought that I was an incredibly mentally strong person. However, in recent months I think I've reframed that as being a very determined and mentally disciplined person. I'm driven, and, if I'm really honest with you (and myself) I'm something of a perfectionist. I'm very good at setting myself lofty and slightly ridiculous targets e.g. get five As at A Level – I didn't need five As at A Level, AAB would have done to get me into Cambridge, but for some reason it's in me to set those kinds of targets. I set a similar goal with my podcast, The School Success Formula, when it first launched – to publish an episode every week for a year. I hit my target but I got burnt out in the process. It's in the aftermath of that burnout that I've really started to reflect on my own mental health story and see it for what it is. Living in a village, most of my friends lived a fair distance away and I relied on my parents to drive me to see them. This meant that I often felt a little bit lonely and isolated from my peer group – but this had absolutely nothing to do with the exams and the school work itself. With the academic side of things, I was totally focused. I had a very strong purpose and motivation and I just went for it. But, I also had enough insight to put some things in place to protect myself. For example, when I was studying for my A Levels I may have studied for four hours every evening after school Monday to Thursday, but I always, always, stopped at 9 pm. I literally put the pen down at the end of the sentence I was writing at 9 pm, packed my bag for the next day and then spent at hour relaxing, before getting ready for bed and reading at 10 pm. I did this because I knew I couldn't learn effectively, and I'd be really grumpy, if I didn't sleep from 10:30 pm until 7:30 am. I never worked on Friday evenings – and this is a rule I've pretty much stuck to for the rest of my life. On some very rare occasions I've made an exception but I know this rule is good for me, almost necessary to keep me on track, so I stick to it. On Saturdays, I usually went to watch the Leicester Tigers with my dad. It gave me a point of interest in my week, got me out in the fresh air, a change of scene and it was social too. On Sundays I had my own little routine – usually a lie-in, studying while I listened to the top 40 on Radio 1, we'd have Sunday lunch as a family and I would never work on a Sunday evening, instead I'd watch whatever drama was on the TV at that time, with my mum and my sister. So, I won't lie to you – getting through my A Levels and getting those five As was in no way easy. It took huge self-discipline and determination, but I had this imperative, to get into Cambridge, that kept me going, and I had these ‘rules' that I kept for myself to keep myself healthy and on track. It was at the end of my first year at Cambridge, when I was revising for our first-year exams. I had been homesick all year and, even though terms were only eight weeks long, been home at least twice per term for the weekend, as well as having my parents visit once or twice. I also emailed my mum daily – it was in the days when mobile phones were incredibly expensive to use, so using the college's free computers and email address was the very best way to keep in touch. This, as well as making the best group of friends I'd ever had, had got me through most of the first year. But, there was one weekend where practically everyone else disappeared. They went home, holed themselves up in their rooms to revise, I don't know what, but I was left alone. On top of that, I'd decided, for some unknown reason, that all of a sudden I had to save money, so I'd bought the ingredients to cook for myself rather than go to the college buttery, where there was always someone to talk to, for my meals. On top of that, I was grappling with revising some of the material that I'd found most difficult in my first-year course and I'd experimented with a new work routine – getting up at 7 am and working through until 1 pm without any real break. The first morning I tried it, it was amazing. But on the second day, I couldn't do it as I'd expended all my energy and concentration on the first day. It wasn't a sustainable routine. Finally, my mum wasn't replying to my emails, when she always did within a few hours, and when I tried to call there was no answer. For me, this was a perfect storm. I was lonely, I probably hadn't consumed enough calories because I was cooking for myself, my mum wasn't providing her normal back-up for me, the work I was doing was one of the most difficult things I'd had to get my head around in my life and I'd exhausted (and disappointed myself) with an unsustainable work routine. On the Saturday evening I lost it. I started crying and couldn't stop. Instinctively I knew I had to get out of my room and away from my desk. So, as the sun was setting I set off walking and ended up on the path to Grantchester. Walking it out has always been a pattern in my life – fresh air, nature and exercise have always had a calming effect. As the sun set across the water meadows I let out all that emotion. Goodness knows what the people who passed me thought of me. But, by the time I got back to my room, I was a bit calmer and managed to go to sleep. The next morning, I tried again to ring my mum, and this time I got through. I can't remember what had been going on that had meant I hadn't been able to get through to her and had prevented her from emailing, but as soon as she heard my voice she asked me what the matter was. It normally took 1 hour and 15 minutes to drive from my family home in Northamptonshire to my college in Cambridge. That Sunday morning it took my mum less than an hour. Some of my friends saw her arrive in the Porter's Lodge – they said they didn't say hello to her because she looked like a ‘mother on a mission' as she stormed through, towards my room. She scooped me up, as well as my books, and took me straight home. I revised for a week with home comforts and my mum looking after me. She delivered me back to Cambridge to take the exams. I'd done what I needed to do to pass, but I didn't cover myself in glory. They were the worst set of exam results I'd ever had. But, I'd done enough to get me through. I think the most important thing that went wrong that weekend in Cambridge was that my support systems broke down. When I've had other similar melt-downs in my life – usually at least three of the above are components. Now, I know I have never suffered from a severe bout of medically diagnosed depression or anxiety. But, I think I could have done if I hadn't had the insight into my own inner needs and workings, as well as the right support system. So, what can you do to support your child's mental health while they're taking exams? But, before that, I think we need to reframe some of the conversations and things that I hear people saying about exams. These kinds of things aren't a terribly helpful way of looking at them. The exams are what they are, and however much you might complain about them, you're not going to change them in time for your child. So, instead, we need to find positive ways of looking at them. So, for example – instead of saying “These exams are too hard,” we can celebrate the fact that our children are learning lots and that, finally, our country is being ambitious for our children and our education system. It shows enormous belief in their capabilities that these exams have even been set – and, I for one, truly believe that with the right plan and the right support anyone can step up to the challenge and make the very best of it. As for complaints like, “There's so much content for them to learn, it's impossible,” I really want to warn you against saying this kind of thing in front of your child. So, just be really careful about what you think and say – look for the positive in the situation rather than the negative, and that will be more helpful to everyone. I recently read the book The Self-care Revolution, by Suzy Reading. She's a psychologist and yoga teacher – and one of her pillars of self-care is to have purpose. I think this is so important for everyone's mental health. When you get up each morning you need to know what you're going to do with your day. As you're working towards a big project you need to know what it's for and why it's important to you. Exams actually give our teens purpose. Rather than just drifting through the teenage years ‘having fun', gaming, hanging out on social media etc they're doing something constructive; exams give them the imperative to learn. But, within this purpose, if you've got a child that's more like me, that sets themselves ridiculous goals (like getting five As at A Level or publishing a podcast episode every week for 52 weeks) you need to help them set realistic expectations. I strongly suggest you check out my podcast interview with the perfectionism and gifted child expert, Lisa Van Gemert, for more tips on how to help your child set realistic expectations of the results they can, and need, to achieve. One of the best things I did at school and at university was to set limits and boundaries around my work. Now, some people may think that the four hours per night routine was extreme, but so long as I stopped at 9 pm on the dot and went to sleep by 10:30 pm, as well as not working on Friday, Saturday or Sunday evenings, it was sustainable. I did something similar at university – I treated my studies like a job and worked from 9 am to 6 pm most days (with breaks for meals and tea with the girls). I didn't work in the evenings until I was in the third term of my third year, preparing for my finals. I knew what I was capable of, and I keeping within those bounds kept me on track. As you probably picked out from reading my story – my support system, a.k.a. my mum, was extremely strong. When I was at home, she provided an amazingly secure foundation of practical and emotional support. Dinner was always on the table at the same time, she did all the laundry, there was always a hug or an encouraging word available. When I got to university, mum was still there daily giving me that emotional back-up, but I also had my girl-friends. We had such amazing times together – just drinking tea and talking, talking, talking (and giggling a lot). Things, like eating good food three times per day, moving your body, even if it's only to walk to school and back, and getting a little bit of fresh air, are crucial to maintaining wellbeing and mental health. When these things slip everything else tends to fall apart (listen to this podcast episode where Dan Licence tells us about his experience of depression while he was at uni to understand that). One of the biggest things I hear from mental health experts is that these common-sense ways of looking after your physical health, things your granny would tell you to do, are also fundamental for mental health. So, make sure they're there for your child. Try to make sure your child doesn't just communicate with the rest of the world through a screen. I know I go stir-crazy if all I do is hang out with my computer all day. Going to school helps with this, but if they can have some social activity or interest where they see people face-to-face all the better. One of the things I've struggled with most in my adult life is not having the school holidays in the way that I did when I was younger. When I was at university, I used to come home at the end of the summer term and just spend two weeks sleeping for 12 hours a day and watching Wimbledon for the other 12 hours. I needed to just recharge before I could get on and do anything else. So, work out how many breaks your child needs and when. Some parents make their child take one day per week away from the books. Others have learned through experience, that they need to be careful how much they schedule into half-term. Everyone is different, there is no one-size fits all approach, but you need to observe and implement what works for your child. There will be certain aspects of exams that your child really struggles with. Maybe there's one particular subject, or maybe it's just a topic within a subject. Maybe it's everything. You need to be realistic about how much of this difficulty they can cope with. If there's one subject, can you look into them dropping it? I know often students are allowed to drop a language and channel their energies into other subjects if they're really struggling with it. However, if maths is the issue, the best thing you can do is support them to scrape through the exam first time so that they never have to retake. If there's a topic that they struggle with, what additional resources or help can they get with it? If they can't crack it, focus on knowing everything else as well as possible and hope that one doesn't come up. If academic study itself is a massive issue for your child, and ultimately damaging to their self-esteem – what can you do to minimise it? What's the bare minimum they need to scrape through so that they can move on to doing something that feeds their soul and makes them feel good about themselves? What can they do in their spare time that builds their confidence and self-esteem? I'm not qualified to give you advice about medically diagnosed mental health issues like depression and anxiety. I have spoken to some experts about it though. This fantastic episode on anxiety from psychotherpist Alex Carling is well worth listening to, this one on teen mental health gives great background and some actionable tips, and this one on grief from Dipti Tait has also had great feedback. 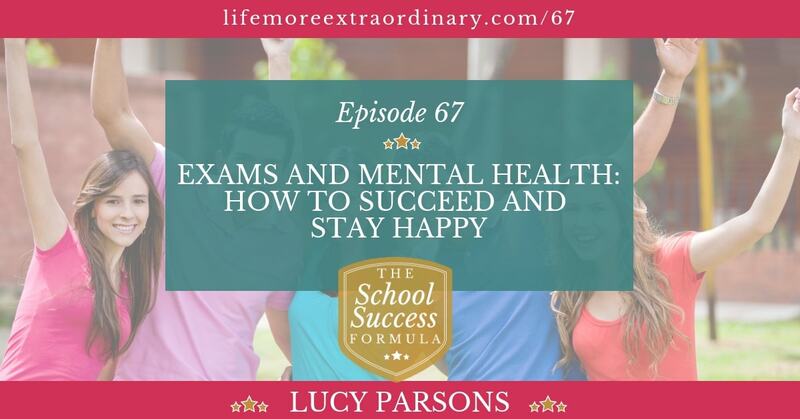 Exams can be a huge boost to mental health if you manage your health so that you do well. However, if you manage your time, emotions and physical health badly in the build-up to exams they can go horribly wrong. I've helped several students to significantly improve their mental health. Not because I've worked with them specifically on mental health, but because I've given them confidence and given them healthy structures to work within. One student who I worked with in year 12, in the build-up to her AS exams, had had a panic attack after every GCSE exam she took. She didn't have any around her AS exams because she was confident in her approach and healthy in her routine – that's what I helped her with. Another year 11 student who is a current member of The Extraordinaries Club has moved from being very anxious and panicky about revision and exams, to being happy, balanced and doing well. This is as a result of learning how to study properly from me, and her mum being an absolute rock and doing things like meditating with her every morning. 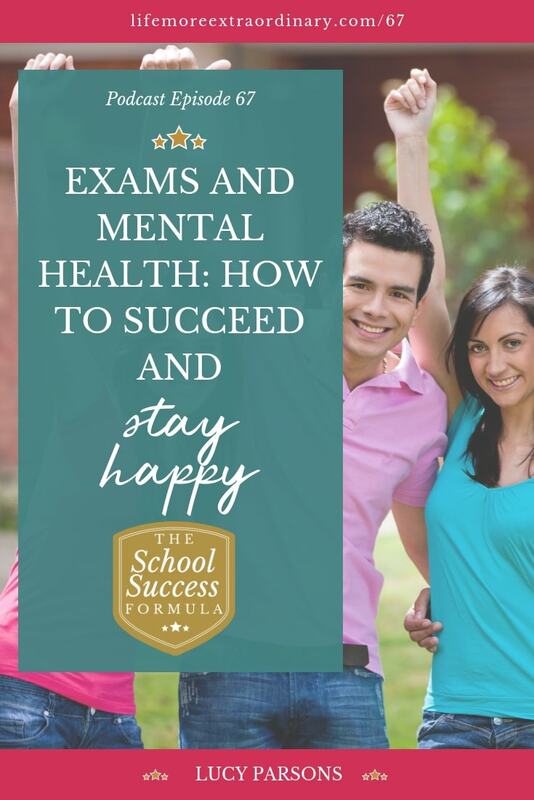 I'd love to help you and your child to manage their mental health effectively through the exam years. If you're interested, sign-up to The Extraordinaries Club and start implementing my study system – it's designed to help you find a way of succeeding in exams that works for you, in a healthy balanced way. Click here to find out more and sign-up.